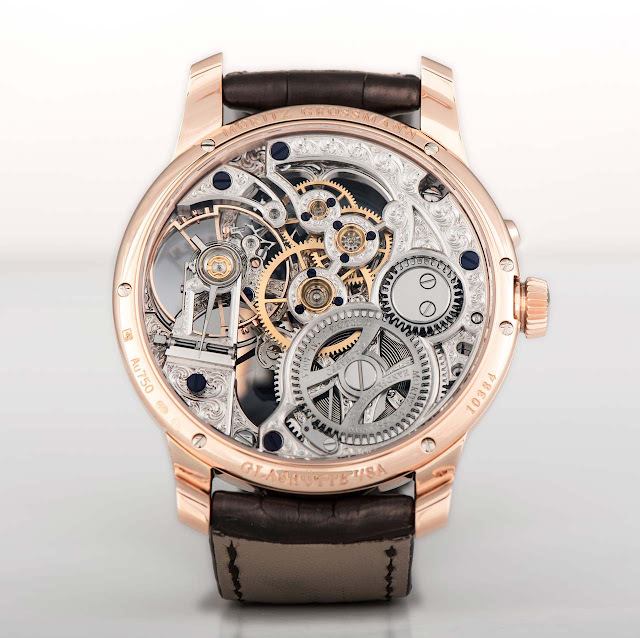 In collaboration with master skeletonizer Christophe Schaffo, Moritz Grossmann is presenting an exceptional skeletonized piece, the ATUM Skelett. 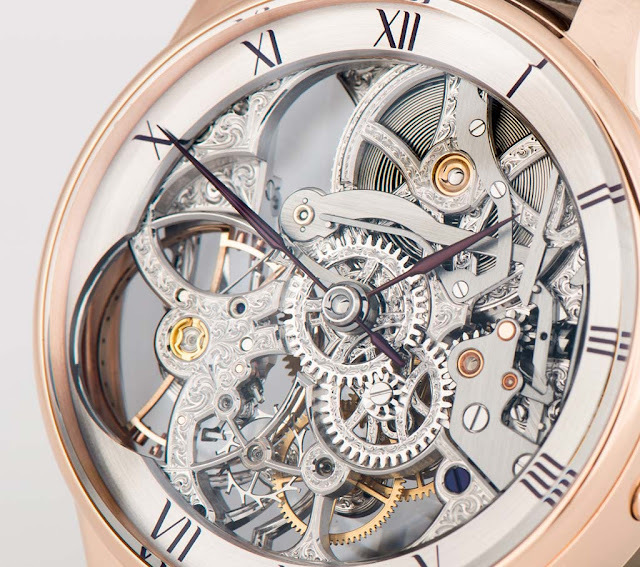 Housed in the 41 mm gold case of the ATUM model presented at Baselworld 2016, this work of art combines horological precision with aesthetics by cutting away all the parts of the movement which have no active function for its operation and then chamfering, engraving and decorating the remaining parts. As it is easy to imagine, countless hours are invested in this delicate operation which requires gifted hands and experience. Christophe Schaffo learnt the art of engraving at the Ecole d’art de la Chaux-de-Fonds and while working with his father Kurt Schaffo, an independent watchmaker renowned for his hand engraved skeleton works created for the most demanding connoisseurs. In 1985, Christophe opened his own workshop in La Brévine where he designs and crafts exceptional timepieces entirely by hand, at most ten per year. The hand-wound calibre 100.5 and its large 14.2 mm balance wheel - beating at 18,000 vibrations per hour with a power reserve of 42 hours - can be admired from both sides. The distinctive Moritz Grossmann winder remains visible at 4 o’clock. When the user pulls the winding crown out, the winder switches to the hand setting mode and simultaneously stops the movement. The crown immediately returns to its home position but can now be turned to precisely set the hands. Once ready, the movement can be restarted by pressing the push button at 4 o’clock so avoiding the possibility to alter the positions of the hands. At the same time, the mechanism switches back to the winding mode. Love this brand a bit more every time I see a new model. Need to handle them soon. 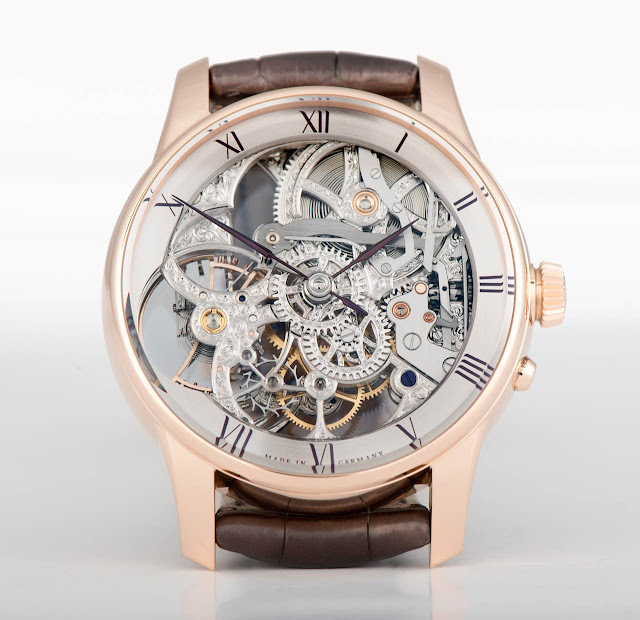 Moritz Grossmann ATUM Skelett, unique piece. In collaboration with master skeletonizer Christophe Schaffo, Moritz Grossmann is presenting an exceptional skeletonized piece, the ATUM Skelett. 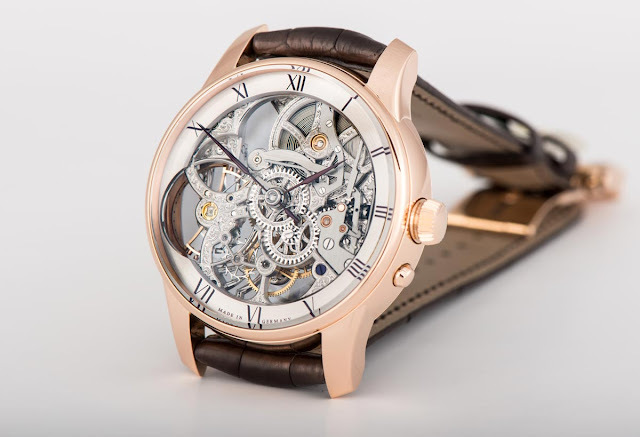 The Moritz Grossmann ATUM Skelett is a unique piece and the lucky owner will have the option to choose either a rose-gold or white-gold case. The price is Euro 94,000.